Additional parking is provided in the rear of the new church building. We hope, if the Lords wills, to purchase more property in the future to better suit the needs of our growing congregation and the visitors who come here. Mt. Nebo Baptist Church was organized January 12, 1907 at Liberty School House. A presbytery composed of Elders L.P. Gwaltney, R. Lee Davis and Brethren H. Christopher, Tison Burgess, and T. P. Lackey organized by electing L. P. Gwaltney as moderator and R. Lee Davis as secretary. Upon the moderator's call for letters, seventeen from Sulphur Springs and four from Macedonia presented their letters. After examination of these, the presbytery declared those constituting Mt. Nebo Baptist Church to be orthodox. Upon the adoption of the covenant, they were declared a legally constituted Baptist church. Elder J. N. Binkley was called as pastor. G. Lee Steele was clerk. Those serving as pastors included: C. F. Friday, Rev. Caudal, George Bumgarner, Rom Stevenson, J. W. Watts, Elbert Payner, Bub Bumgarner, Bub Linney, Frank Peeler, Otto Johnson, Lee A. James, R. C. Lloyd, Wade Rogers, W. A. Hefner, C. W. Bunton, Warren Hemric, Buster Treadway, Denny Dyson, Robert L. Ferguson, and Brian Eades (present Pastor). In 1940, the church was rebuilt. In 1952, four Sunday School rooms were built. Entrance to the church was changed in 1967 with the addition of a vestibule, porch and walkways. In 1973, two additional Sunday School rooms were added. 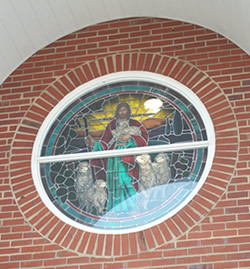 Double glass doors were installed at the entrance of the church in 1980 and a new steeple was installed in 1981. In November of 1985, our church began construction of a fellowship hall. This building was dedicated March 30, 1986. During the last ten years, various improvements have been made to the church buildings and grounds. A new church sign was installed November 1989. Bathrooms were added and the front of the church building changed in March 1990. The interior of the sanctuary was remodeled and new carpet installed in March of 1993. 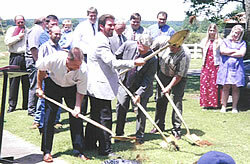 The existing parking lot as well as a new additional parking area were paved in 1995. A new Sunday School building with an extension to the existing fellowship hall and breezeway were constructed in 1998. A new church sanctuary was constructed 2002-2003. 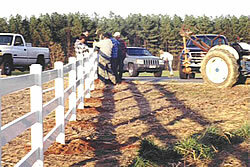 A ceremony to dedicate the new sanctuary was held May 18, 2003. 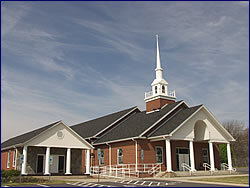 In the fall of 2006, a new Multipurpose/Gym complex was completed to promote church fellowship and youth activities. so you will not lose this page. 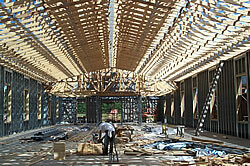 Below are a few photos of our construction of the new sanctuary 2002-2003. Click above to view a complete slideshow of our construction photos.